THREE SONGS ABOUT MOTHERLAND depicts a dramatic collision between the past, the present, and the future in contemporary Russia by focusing on three different cities in this vast land. In the far eastern city of Komsomolsk-on-Amur, a still-living symbol of Soviet industrialization in the 1930s, older Russian citizens speak about their youth, when they felt part of something bigger than themselves: building "a city of communist dreams" in the middle of nowhere. Some cling to the promise of those glory days while others, express regret and disappointment at its ultimate failure. Then, the cosmopolitan city of Moscow bids farewell to Anna Politkovskaya, the fearless journalist and human rights activist who was assassinated for her political activity amid the chaotic power struggles of the post-Soviet nation, fighting to her death for a young Russian democracy. Finally, residents of Khanty-Mansijsk, one of the main centers of Siberia's budding oil industry, speak about their beloved fairy tale-like town, where the communist dream has been swept away by new aspirations for a prosperous future. And what are they, today's aspirations? What is behind the fairy tale? Will the new "capitalist dream" come true, or will it turn out to be another illusion, another myth? In the words of the great Russian poet Fyodor Tyutchev, "We are not destined to foretell." 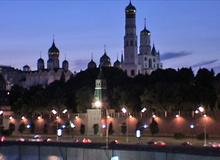 During the course of the film, three songs performed by contemporary singer Elena Kamburova serve as a leitmotif which unites these three separate stories into one cohesive whole: a frank and vibrant picture of Russia today. Yulia and Katia are inmates held in a Siberian mental facility against their wishes. This kaleidoscope of people and events in the great museum unfolds into a poignant account of Russia's painful 20th century transformed by the "dwellers" intimate relationship with the art. Unforgettable life stories told by survivors of the Siege of Leningrad, where more than 1 million people died during World War II.